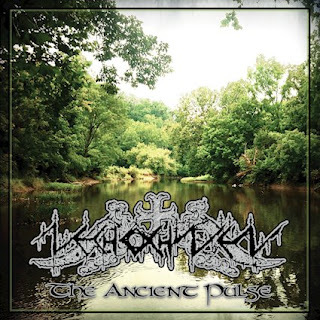 Nechochwen are a duo from West Virginia that has had an album reviewed before in this zine and plays a mixture of black metal and Appalachian folk music and this is a review of their 2018 compilation album "The Ancient Pulse" which will be released on October 26th by Nordvis. Acoustic guitars start off the compilation and also bring in elements of Appalachian folk music as well as using a mixture of full chords and finger picking along with some clean vocals a few seconds later while some songs also bring in steel guitars and percussion and some of the tracks are very long and epic in length. Some of the tracks are instrumentals while grim black metal vocals are into the music as the compilation progresses which also leads to a heavier direction along with the solos and leads being done in a very melodic style as well as the slower sections of the songs also mixing in elements of doom metal. Spoken word parts can also be heard briefly while the faster sections of the songs also using a great amount of tremolo picking and blast beats which gives the songs more of a raw feeling along with the riffs also adding in a great amount of melody as well as the music also bringing in a great mixture of slow, mid paced and fast parts. later song s also adds in a small amount of psychedelic elements, nature sounds and Native American style chanting and they also bring in Rotting Christ and Ozzy Osbourne covers. On this compilation Nechochwen plays some songs in an Appalachian folk music direction, some in more of an atmospheric black metal style and they also mix the 2 different genres at times to create something very original, the production sounds very professional while the lyrics cover Native American Traditions, Tribal Rituals, Nature and History themes. In my opinion this is a very great sounding collection from Nechochwen and if you are a fan of atmospheric black metal and Appalachian folk music, you should check out this compilation. RECOMMENDED TRACKS INCLUDE "The Lodge" "Allumhammochwen - The Crossing" "Heya Hona" and "Song Of The White Tailed Deer". 8 out of 10.